Born in 1940, Rajlich founded the avant-garde Prague group Klub Konkretistů, in the wave of the international neo-avant-garde movements symbolized by Azimut in Italy, ZERO in Germany, Nul in Holland. 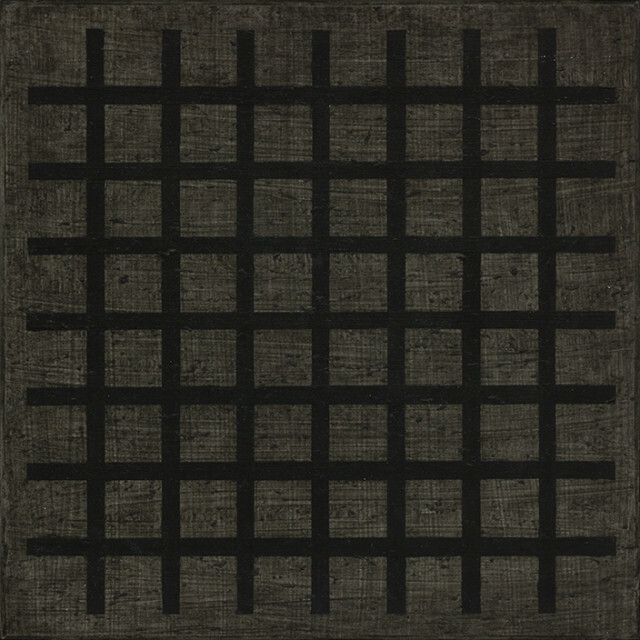 After expatriating Czechoslovakia in 1969 following the Soviet invasion, Rajlich moves to the Netherlands, where the avant-garde atmosphere is alive and where his conception, based on working on regular squared grids, close in a way to Piero Manzoni’s Achromes, is immediately very welcome by the heart of growing conceptualism. In 1974 he has very important solo exhibitions at Yvon Lambert in Paris, at Art & Project in Amsterdam and at Françoise Lambert in Milan – for many years his reference galleries – and the following year he is one of the main artists, together with Brice Marden, Robert Ryman, Gerhard Richter and others, in the memorable exhibition “Fundamentele schilderkunst / Fundamental painting” at the Stedelijk Museum in Amsterdam, a milestone event for the international affirmation of Analytical Painting. Soon Rajlich’s work focuses on the discovery of a full color dimension, open to symbolic and poetical influences, towards more open gestures and an irrational aliveness, through the addition of a spectrum between yellow and red, sky blue and pink and gold, without modifying any aspect of the rigorous essential structure of monochrome. In 1993 Rajlich’s first italian retrospective at Palazzo Martinengo in Brescia, followed by the ones at the Haags Gemeentemuseum dell’Aja in 1994, the Kunsthalle in Karlsruhe in 1996, Prague’s National Gallery inl 2008, as well as the Gemeentemuseum in The Hague in 2016, the Museum Kampa in Praga 2017 and in 2018 at the Boijmans museum in Rotterdam. Rajlich has been recognized as one of the main artists among the international neo-avant-garde panorama. From 1999 to 2002 Rajlich was artist in residence at the Centre Pompidou in Paris. His works are held in the collection of that institute as well as by the Centraal Museum, Utrecht, the Musée d’Art et d’Industrie, Saint Étienne, the Musée Cantini, Marseille, Museum Boijmans-Van Beuningen, Rotterdam, the Museum of Modern Art, New York, the National Gallery, Prague, the Peter Stuyvesant Foundation, Amsterdam, the National Gallery of Canada, Ottawa, the S.M.A.K., Ghent, the Stedelijk Museum, Amsterdam, the Stedelijk Museum, Schiedam, the Stedelijk Museum De Lakenhal, Leiden, the Stedelijk Museum Het Prinsenhof, Delft, and others.